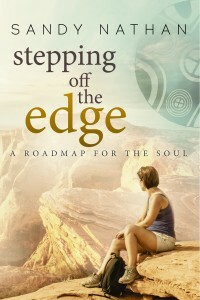 Sandy Nathan's YOUR SHELF LIFE » Stepping off the Edge: A Roadmap for the Soul – Coming at you! Award-winning Author Sandy Nathan's Blog for Readers, Writers & Everyone in Between. Exploring the Joy of Life with Books. 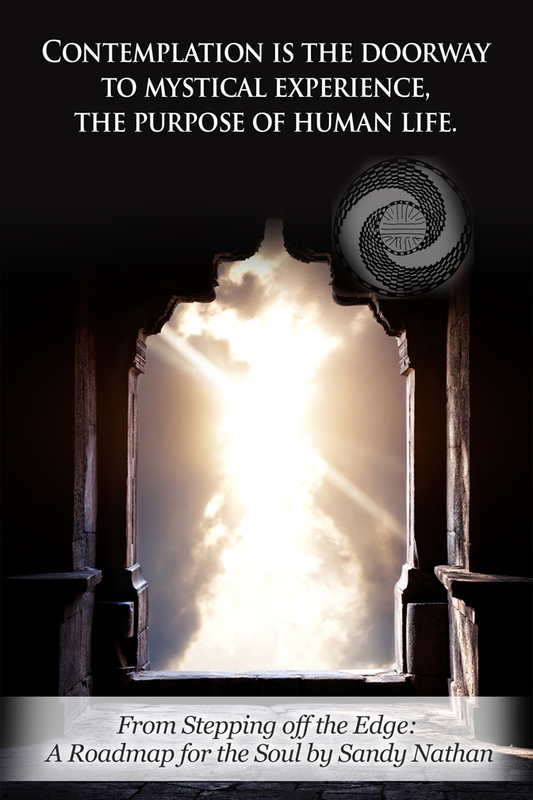 Stepping off the Edge: A Roadmap for the Soul – Coming at you! Are you ready to step off the edge? Stepping off the Edge: A Roadmap for the Soul is the new edition of my spiritual classic. Why should you be interested in Stepping off the Edge? Do you have an on-line addiction that is threatening your job, relationship, and sanity? Do you feel that you don’t know who you really are–in the big sense of what you’re doing on the planet and in the little sense of why am I here? In Podunkwalla USA? In this skin and particular life? Have you lost something important–a spouse or kids or everything you owned? Is life a pain, or even worse, dull as sawdust? Would you like to go somewhere where you could learn something worth learning with people worth knowing? My life has worked out and that’s my primary credential in writing this book. I’m sixty eight years old and an happy! That may be the most important thing. I’m happy, content, and in love with my husband of forty years. I love my work–writing for you–and live a beautiful California horse ranch surrounded by animals and people I love. 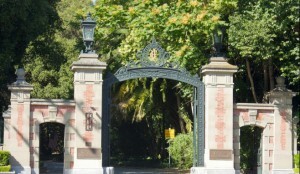 These are the gates to the estate on which my family lived. We didn't own the whole thing, it had been subdivided years before. We had an acre of paradise. My life wasn’t always like that. When I was eighteen, my father was brutally slain by a drunk driver. At that time, I had a charmed existence. My parents owned the tenth largest residential construction company in the USA. We lived in what is now the third most affluent town in the country. I showed horses and water skied on weekends. Within months of my father’s death, I lived in a tiny apartment at below poverty income. I won’t talk about how that happened, but it did. My brain still thought I was upper class, Why aren’t you doing more charity work, Sandy? I was seriously depressed for a decade after my father’s death. I didn’t know it and it didn’t slow my down; I earned two master’s degrees and part of a PhD. I was the Santa Clara County economic analyst. Big titles, big jobs, while my soul labored to keep me moving and darkness drifted just out of sight. A huge breakthrough occurred when I attended one of the giant enlightenment seminars during the 1970s. One of the participants wore a blanket around her hunch shoulders. She shuddered and cried the entire weekend, a living plea for help. The seminar leader gave it to her, stripping her to her truth. He showed her and everyone else that she was identified with physical illness and in love with the attention she got as a sick person. He also helped her expose what her sick act had cost her: a husband had walked out on her; she’d lost her kids. She got it, at least then. Some people really have sickness down. They may be "sick" all their lives, oh, eighty five years or so. Someone in my life was like that. I had assumed that her “sick act” was as immutable as the fabric of the universe. A Mount Rushmore of the soul. I was also forbidden to feel/express any resentment or be anything but kind and empathetic. The seminar leader showed me that the woman’s behavior was an act, an unconscious but very powerful role that had taken over her life. As an act and not the real her, it could be changed. I saw. Even if that person who was impacting me so much couldn’t change, I could. How did I get from that moment to now? It’s all in Stepping off the Edge Took thirty-nine years. I did everything from getting an MA in Marriage, Family and Child Counseling to spending thirty years with a meditation school based in India, to coaching negotiations at the Graduate School of Business at Stanford, to working on myself every way I could. Stepping contains the fruit of my spiritual pilgrimage. 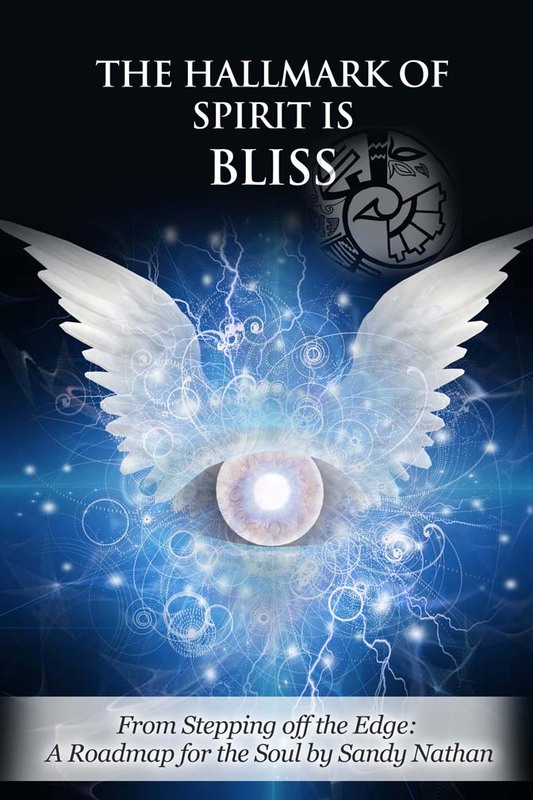 Bliss accompanies spirit. If you're thinking about studying with someone don't feel blissful around him or her, you're in the wrong place. My intent is to get your attention. What Stepping is about is very important: you and who you really are. Want another teaching aide? Check this out. I’m having a bunch of these “Maxim Cards” made up on key points from Stepping. The three presented here deal with the basic issue: What is spirituality? What is spiritual? I’ve got cards made up in nine other areas, ranging from What is your true identity? To How to establish a personal spiritual practice? All the way to Spiritual traps and dealing with evil. I like things presented so everyone can understand them. Take a living person. Then look at a dead one. The difference is spirit. No spirit, no life. One of the things about being an older person is you know you don’t have forever to do whatever you came to this earth to do. That’s one reason I’m putting the new version of Stepping off the Edge. It’s behind my push to get these materials to you. They’re beautiful, impactful teaching aides giving you jewels of spiritual exploration. What do they cost? Nothing, at the moment. I am discussing selling them with a retailer. So, download while you can. Contemplate and apply always. 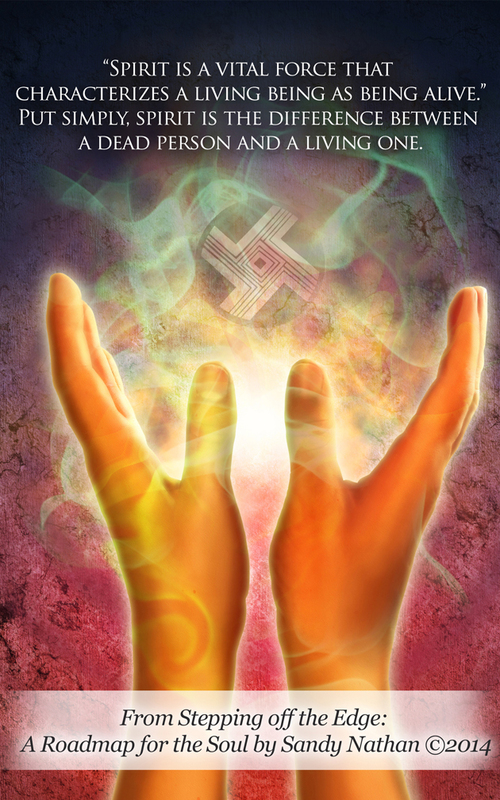 How to you fully experience your spiritual nature? 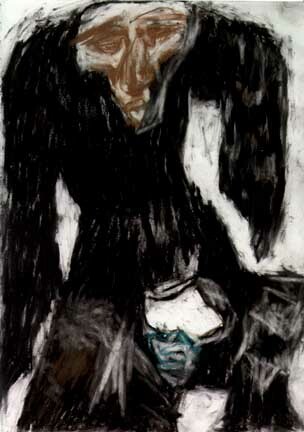 Contemplation–attention fixed on an object–is a very good start. Want more than pictures? How about music, color and movement? A video! Let this run through once to buffer. It’s HD so you can watch it full screen. Enjoy! Sandy Nathan/Vilasa Press on Facebook, my professional page: My albums from Vilasa Press. All the Maxims are in there. Please “Like” my page! Sandy Nathan/Author on Facebook, my personal page: My albums. Lots of them. You can look through the ones on Stepping and all the rest. If we aren’t FB friends, send me a Friend request and I’ll Friend you. My Pinterest boards are here. The Maxims have boards of their own and you’ll find lots of other interesting stuff. Feel free to borrow and repin. The text of the second edition of Stepping isn’t much different that the first edition. I didn’t change the book very much for a bunch of reasons. Reading it again told me that nothing has changed; in fact, spiritual life has gotten much worse for many people in the last. More on-line addiction, more seeking and striving and killing one’s dear self to attain success as a commercial writer, more of everything I talked about back in 2007 when the first Stepping came out. What’s to change? 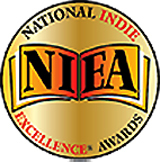 National Indie Excellence Awards 2007: Finalist in THREE Categories: Autobiography/Memoir, New Age Non-Fiction & Spirituality. The Benjamin Franklin Awards and IPPY Awards are probably the most prestigious, largest, and oldest contests for independently produced books. This was my first book and I didn’t realize what a big deal those wins were. Now I do. For more about the original Stepping off the Edge, check out my website. ← London Houses, Country Estates, Royalty, Etiquette, Polo, and Golf – Will the Leroy Watches Jr. We Love Survive? SANDY NATHAN’S Book, LADY GRACE, Was Selected by FREEBOOKSY! eBook Architects –– Conversion of book files to eBooks for Kindle, Nook, and other electronic readers. Streetlight Graphics – Book Covers & Interiors and eBook Production.